Liked it so much, I loaned it to my son, for him to try. Just bought him one as a gift. Excellent product, excellent service. Great holster and company. Customer service was a great help with a small problem I had. Not of their doing but they still made it right. Completely satisfied with this holster. The holster is made with quality products. It is probably the most comfortable IWB holster I have ever owned. I will be purchasing more equipment from this company. Very satisfied! Bought this as a gift for my fiancé and he absolutely loves it! After going through countless others that “didn’t stand the test of time” I was referred to this product and couldn’t be happier. Fiancé loves the comfort and easy access that this holster provides. Future purchases for holsters are a must! This is the first MTAC I purchased. I had purchased three Spartan holsters in the past. 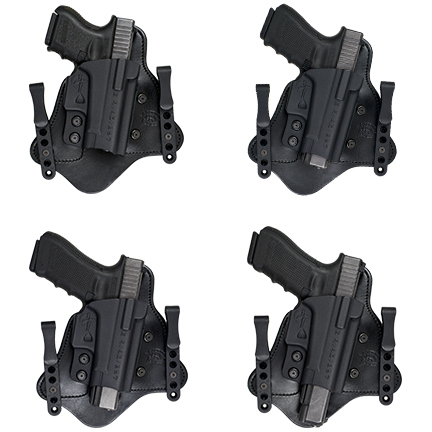 All four holsters are concealable and comfortable. I absolutely love this holster!! Very comfortable to wear!! I’d recommend this holster to anybody. My only criticism is that that this holster isn’t made for larger framed firearms like the FNX45 ot the CZ97. I have 8-9 Comp-Tac holsters for various pistols in various sizes, IWB and OWB. The molded fit, leather backing and the ability to adjust tension are all quality factors that keep me coming back. No need to shop around, you won’t be disappointed.